Visit the peaceful towns and excellent beaches of Denmark. Take a road trip through the country in a Campervan, stopping at beautiful spots whenever you feel like it. Denmark holds many prestigious "Blue Beach" awards and the beaches are equal to any Mediterranean destination. Denmark itself is the southernmost of the Nordic countries, located southwest of Sweden and south of Norway, and bordered to the south by Germany. Denmark's shores extend to both the Baltic and North Seas. The country consists of a large peninsula, Jutland (Jylland) and many islands, most notably Zealand and Funen. 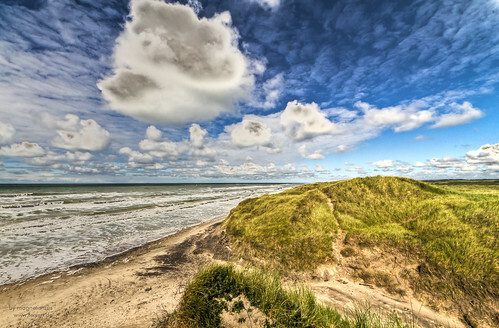 Visit the northern most point of Jutland and see the Baltic and North seas merge. 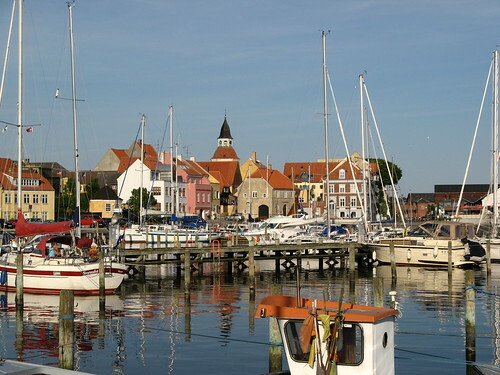 Experience the unique atmosphere, historic streets and many museums and attractions in Ribe. Embrace the art and architecture in Arhus along with the Tivoli Friheden. An amusement park for the whole family. 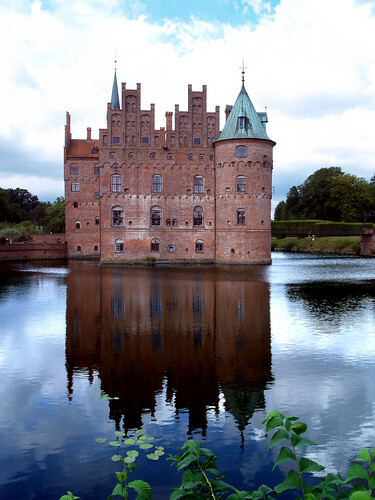 Drive over to Funen with it's Castle's (or Slots) becoming a more frequent occurrence and the towns of Faaborg and Svendborg are well worth a visit. Cruise around Denmark on a roadtrip that will be well worth your time. Find a Campervan for your travels at Motorhome Scandinavia. Enjoy the trip and let us know how it goes or of any attractions that were fantastic! Thy National Park located in southwestern Jutland, is Denmark’s first national park. It is also the largest spanning from Agger Tange in the south and the Hanstholm lighthouse in the north covering an area of 244 sq. km. Thy National Park was shaped by hundreds of years of sand migration which is evident in its sand heaths, sand plantations, dunes, coastline and lakes. Thy National Park could well be one of Denmark’s “last wilderness”. The park is best enjoyed by nature lovers who prefer the quiet solitude and peace and quiet of a natural park. Though the park has comfortable inns and campsites for campervans, there is also a patch of primitive campsites for the more adventurous. This is a great place for a Denmark motorhome rental holiday. Note that Danish national parks are not amusement centres or museums. There are Danes who live and work in these national parks and that some of the areas in the parks are owned by private individuals. The dune heaths at Thy National Park are unique not only in Denmark but globally. The heath land along the coast alternates with dune plantations. To the north of the park is the Hanstholm Game Reserve where you can find two of Denmark’s cleanest and unspoiled lakes, Nors Lake and Vandet Lake. Nors Lake’s beach is child-friendly. Red deer, roe and some of Denmark’s rare birds like the wood sandpiper and golden plover call this area home. There are more than 30 varied species of birds in the area. Otters have found homes along the protected areas of the lakes too. Isthmus of Agger Tange’s salt meadows on the other hand is the habitat for water birds native to Thy. Agger Tange has been named as an international bird protection sanctuary. The bird tower in Tved Dune plantation is best seen in the months of March and April when it is possible to view dancing cranes. The dunes along the coastline present great beaches for swimming. Isbjerget provides barbecue and bonfire facilities. The area is actually the highest point in the Hanstholm Wildlife Reservation at 56 meters. A fishing platform for disabled is accessible here too. Thy National Park covers some evidence of remnants from the Bronze Age. The German bunkers along the coast are a reminder of Denmark’s WW II history. The long-ago farmlands have been replaced by dune heaths and dune plantations all due to the harsh wind and sand drift to the land. The park is not without some attractions. The small fishing villages of Stenbjerg Landingsplads and Nørre Vorupør are still active and offer a view of the fishermen’s daily work. The North Sea Aquarium in Nørre Vorupør has some rare species of North Sea fish caught by these fishermen. Klitmøller and Stenbjerg Landing Place are places to visit for a great view. The park can be toured by feet, bikes, horses and cars. There are several sign-posted paths for trekkers, cyclists and mountainbikers. You can rent an Icelandic horse should you wish to tour the park by horse. However there are designated areas as to where you can walk, bike, drive or ride. For those who are into surfing, Klitmøller is the place to be. No matter where you are at the Park, it is possible to “feel” the grandeur of nature. The park is best enjoyed by nature lovers who prefer the quiet solitude and peace and quiet of a natural park. Though the park has comfortable inns and campsites for campervans, there is also a patch of primitive campsites for the more adventurous. Note that Danish national parks are not amusement centres or museums. There are Danes who live and work in these national parks and that some of the areas in the parks are owned by private individuals. Known as the Island of the Burgundians, Bornholm is a Danish Island in the Baltic Sea near the southernmost tip of Sweden, east of Denmark and north of Poland. Denmark is mostly plain fields and seas but the island of Bornholm is beautiful with its granite hills and steep cliffs overlooking the Baltic Sea. The interior part is lush with green wooded areas speckled with shrubby uncultivated land. The middle of the island is mostly farmland and the southern part, sandy beaches. The island has a population of 45,000 and an area of 588 square kilometres. The main industries in the islands are fishing, dairy farming and arts and crafts such as pottery and glass-making. Tourism is a thriving industry in the islands too for more than half a million tourists visit Bornholm Island each year. The seasons are milder in Bornholm than the rest of Denmark and other Scandinavian countries. For the most part of the year, the island is warm and sunny. Bornholm has been a part of the Viking trade route in the 10th century. The island was under German and Swedish rules but after the Germans lost in World War II, Bornholm was returned to Denmark in 1946 as part of its Hovenstaden Region. Part of Bornholm to the north are the islands of Christianso which is part of the Ertholomene Archipelago. The island has castles and ruins that date back to the Middle Ages. Bronholm is quite easy to reach from Copenhagen, Sweden and Germany by ferry. There are also trains and buses that go to southern Sweden then on to Rønne, Bornholm by hydrofoil boat. More than two centuries ago, there were several painters that came to the islands to paint the scenes of and views of Bornholm. Most of these painters stayed permanently and founded the Bornholm School. Swedish painter Karl Isaksson was one of the first impressionists who took residence in the island. Other famous painters who went and stayed in Bornholm were Olaf Rude, Edward Weye, Niels Leergaard and a Bornholm native painter Oluf Høst. The Bornholm Museum presents a wonderful collection of the island’s cultural history including a ceramic’s museum. A visit to the Erichsens Gård botanical garden is highly recommended. The garden and building date back to the 19th century. The Bornholms Middelaldercenter is located in Gudhjem which is a representation of authentic life led during the Middle Ages. Today, tourists troop to the beaches of Bornholm especially those located in between Rønne and Hasle in the western coast and Dueodde in the southern coast. Biking around the island is also a great way to explore it. The bike paths were former railroad tracks. The villages in the islands are picture perfect. If you prefer to camp in the islands, there are beautiful campsites in Bornholm too. Travelling by motorhome? No worries. There are several motorhome parks in Bornholm such as the one in Sandvig which offers a great view of the sea. Odense is located in the island of Funen and is the third largest city in Denmark and is more than a thousand years old. The lively and beautiful city has a more relaxed and laid-back ambiance than Copenhagen with its pedestrian-only streets, numerous paths, alleys and squares leading to museums, cafés, shops and a host of cultural and musical attractions. There are bike-only paths too for the locals and tourists to get around Odense. However, to really enjoy a leisurely tour of Odense, a walking tour is recommended. These are just some of the attractions you can enjoy in Odense. Located in 206 Sondre Boulevard, the Odense Zoo is the second largest zoo in Denmark. The zoo is a favourite destination for a jaunt. There are giraffes, lions, zebras, chimps, tigers and animals from different parts of the world. The oceanium has manatees (sea cows) and penguins too. The zoo is open the whole year round. In Munkemøllestræde is the childhood home of the famous writer Hans Christian Andersen. He lived in this half-timbered house from 1807 to 1819 with his parents. In 1930 the house was converted into a museum and is currently a part of the main Andersen Museum in Hans Jensens Strðde. The HC Andersen Gardens is behind St. Knuds Kirke and is a sight to behold at the height of summer. The Danish Railway Museum is near the Odense Railway Station. It houses quite extensive models of original locomotives and carriages including sleepers, royal carriages and dining cars. There are model railway layouts, computer games and simulations for everyone to enjoy. For small children are designated play areas. Funen Village or Fyn is an open-air museum with some 30 traditional buildings dating back to the 17th to 19th centuries. The antique buildings were relocated from various sites in the island. A village-like environment was created with the half-timbered houses complete with streets and a village pond, enclosures for livestock and beautiful gardens. The Funen Village looks authentic and presents a picturesque view of “old” Funen. The Cathedral of King Canute the Holy or Saint Knuds Kirke is located south of the Odense Town Hall. It is a commemorative to Danish Saint Knud IV who begun the construction in 1100. The church was burned sometime in the 12th century and then was revamped to a three-aisled church in the 13th century. The construction took more than 200 years to complete. The current interior of the brick church is Gothic style. Odense in Funen Island is accessible by ferry, road and rail.